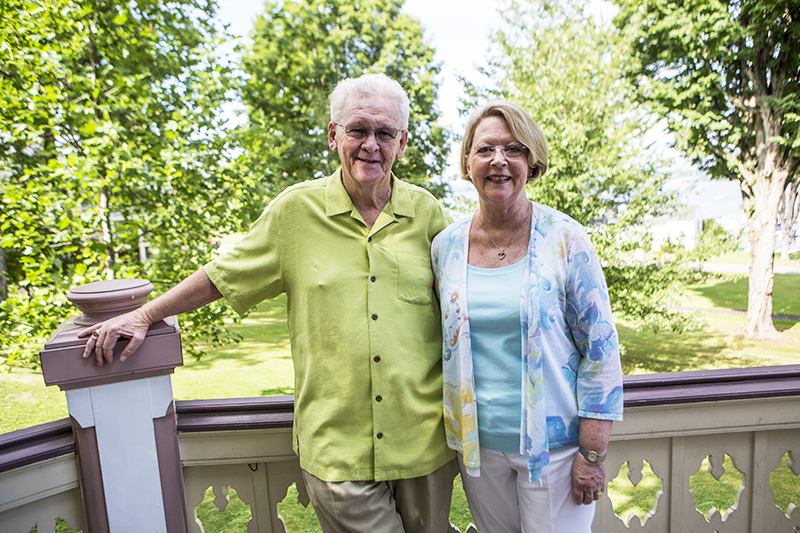 Charles “Cary” and Suellen Lindsay are first-generation Chautauquans, and have loved spending time at the Institution since they first stepped on the grounds by chance more than 12 years ago. The Lindsays cherish education: Susie is a retired teacher, and Cary spent nearly 40 years in the educational publishing industry, most recently as a regional vice president at Houghton Mifflin Harcourt’s West Coast office. “For Susie and me, it’s something that we allocate our summer to allow us to come here; it’s number one,” Cary said. Susie loves the stimulating lectures and overall beauty of the Institution. The couple stays busy at Chautauqua, enjoying the range of programs and entertainment. The Lindsays live in a planned community north of Houston, filled with a diverse population of professional individuals. Both, however, share humble roots. Cary was born in a four-room farmhouse in Southeast Alabama that lacked running water or electricity. Cary’s mother, too, encouraged her son’s love of reading, even arranging for the county bookmobile to stop at their farm house. Susie also came from a farming family. She is a native of Tyler, Texas, where the couple met. In addition to intellectual pursuits, the Lindsays also share a love of travel. Cary has visited all 50 states and approximately 30 countries. For these past 12 years, the Lindsays have shared amazing experiences at Chautauqua — Cary’s fondest being a chance encounter on the brick walk with former Supreme Court Justice Sandra Day O’Connor. Over this span, they have also increasingly involved themselves in ensuring the Institution’s future health and vitality. The couple recently became members of the Bestor Society, making a leadership contribution to the annual fund. In addition to giving back financially, Cary is a volunteer reader for The Chautauqua Prize, and the two have served as Chautauqua Advocates for the past three years. Advocates are dedicated Chautauquans who host regional gatherings and share their Chautauqua experiences with friends, neighbors and colleagues at home. Currently, the Lindsays are responsible for introducing approximately 20 people to Chautauqua. This season, 10 of those 20 came to Chautauqua from states such as Arkansas, Vermont and, of course, Texas. Furthering their family’s legacy at Chautauqua has become the Lindsay’s latest aspiration. They hope their daughter, Claire, and son-in-law, John, will be able to spend more time here with their 3-year-old “most wonderful” granddaughter, Grace. “What Chautauqua exemplifies is learning and growing as a human,” Cary said. With their generous giving of time and resources, the Lindsays are ensuring this experience will be available to others — even for generations to come.